The last few months have been amazing. The Fall is by far my favorite time of year, I love the crisp air, pumpkins and the yellow and reds of the trees in my neighborhood. This year I had a little more time to enjoy the change in season and the chance to watch my growing toddler play in the leaves (I am smiling right now as I write this). It does not surprise me that I have not updated my blog, any down time was spent outside you will all be happy to know. It is cold out there today, so here I am typing away! Reaching a Fork in the Road had a busy Fall, it started out by hitting the road and traveling to the towns of Barnstable, Mashpee, Middleborough, and Norwood to present and help the groups plan and build there Hoarding Task Forces. Each town was unique, but at the same time they are all trying their best to address the issue of hoarding at the community level. Today more than ever it is important for agencies to collaborate in an effort of sharing resources and time. I have had the privilege of working with a number of clients privately. Some of the subjects we have addressed have been simplifying, downsizing a large home, and starting a business. Thank you so much for welcoming me into your lives, it really has been fun to see each of you make changes and find increased happiness. I spoke at the Beverly Sen-net meeting on September 22nd to an audience of close to a 100! The topic: Hoarding and how a Community Responds. I spoke about the work I am doing at Greater Lynn Senior Services as the Hoarding Outreach Specialist. We are providing in home support to individuals who hoard and have started a community group called Greater Lynn HOPE (Hoarding Outreach Partnership Effort). I also attended and spoke at the State Wide Hoarding Steering Committee held at MassHousing in October. MassHousing has led the way in educating housing and other professionals on the subject of hoarding. Which brings us to today- the Sunday after Thanksgiving. I like most of the country plan on exercising and eating healthier after the feast a few days ago. Does a walk around the block count as exercise for today? Some exciting things about to happen include an article that will come out soon in Living Right Along a publication of Northeast Senior Health/Beverly Hospital. A Clutter support group that will begin in January in Peabody. Also I will be looking for sites to host a New Beginnings group that will focus on making the most of your “retirement” years. The group will follow the 2young2retire format, but also allow for those who are currently in retirement to participate. A Thank you if you read this entire post and a Thank you for all of you who have helped and supported my efforts. We all need cheerleaders/champions to encourage and build us up… so we can not only keep going, but do it well. After a week in California I feel refreshed and ready for… another vacation?! How can that be? How can that always be!! I like work, I like home…the day to day- but there is something truly wonderful about having a set amount of time when you can focus not on what you like but instead on what you love. Leisurely meals, ocean walks, time with family and friends- and the luxury of afternoon naps. On this trip I had a chance to visit one of my favorite places, Santa Barbara. 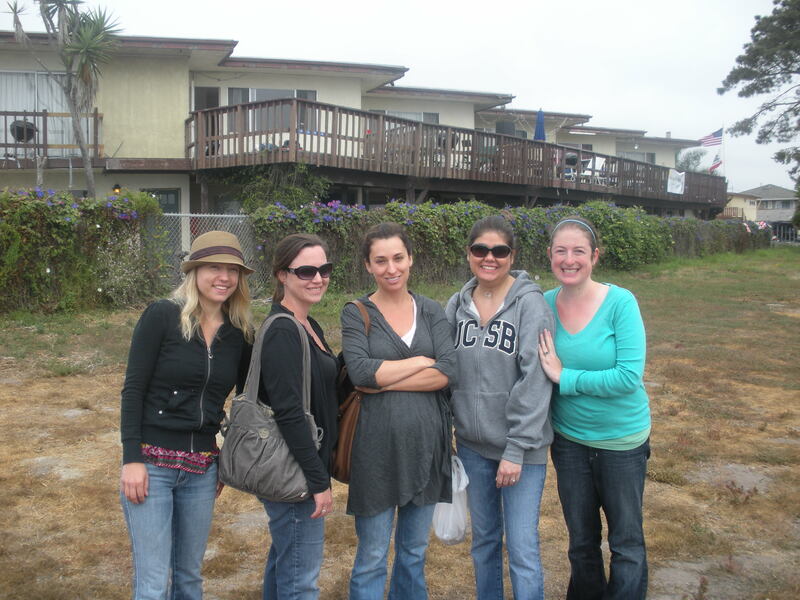 My college friends and I spent a long weekend renting a house in Goleta, close to the University of California, Santa Barbara. Our trip was as much about reconnecting as it was about eating and eating we did- we indulged, as we spent time remembering our college days. So much has changed with our group of friends, yet we are still able to connect and create new memories. I am so thankful that everyone took time out of their busy schedules to set aside this weekend to enjoy and celebrate our lasting friendships. I love you girls!!! August will be a busy month for Reaching a Fork in the Road. I am working with Mass Housing to assist in the creation of hoarding task forces throughout the state of Massachusetts. In the next week I will be traveling to Barnstable and Norwood. I am also putting the finishing touches on a brochure and creating new business cards. I am scheduling groups/workshops for the Fall/Winter. Putting proposals together today. Things are looking up for me…. Who’s next? Last week I was honored with an award for Significant Contributions to Field Studies from Salem State College. I was attending brunch with two of my social work interns and completely unaware that I was about to receive an award. The presenter started reading a speech highlighting the accomplishments of the recipient. I remember thinking to myself, that is so nice and how great that her students have said those nice things about her … then the speech got a little more specific and I said out loud,”really.. me?” By the middle of the speech there was no denying the fact that I was receiving the award. At that point I felt excited, happy and a bit nervous… what was coming next?! At that point the presenter, also a good friend started to get emotional.. I couldn’t help myself, I walked up on stage and gave her a hug, standing up with her as she finished the speech. I realized later that I was probably suppose to wait until the end, shake hands, take the standard photo and sit back down. I couldn’t. I was in the moment and in the moment the right thing to do was to hug my friend and help her finish her speech. I am so thankful to be acknowledged for the encouragement and guidance I have given students over the years. It is truly a joy to work with students (young and more “mature”) they are embarking on a new career and see only the possibilities …. through their eyes the field is new and there are people’s lives to help change for the better. I challenge you to think back to how you felt when you were in school or just starting out in your field…and then think about how you feel today. If your day to day isn’t giving you butterflies- maybe it is time to sign up for a class, attend a workshop or update your resume. OR talk to a student …. their enthusiasm might just rub off on you! It really is amazing how such a simple pleasure as having the sun out today and the ability to walk outside and enjoy some fresh warm air makes such a difference. I notice it not only in my outlook on the day, but also how I feel about my long list of to “do’s” today. I feel ready to tackle the to “do’s” as long as it involves being outside.. lucky for me .. IT DOES! Enjoy the day! Today the web-site has officially started… gulp! It feels real now, I really am starting my own business. I am excited, nervous and optimistic that this new adventure will take off. I love helping people figure out how to live their lives to the fullest .. so before I begin to work with others I am making some changes in my own life, it seems like the right place to start! Cheers … let the adventure begin!